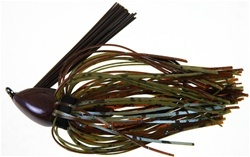 Phenix casting jigs are designed for lighter line and open water scenarios. This jig features the same slender head design as the flipping model that allows it to slide through cover. Specifically designed for casting into open water and also for finesse applications. The hook features a round bend medium wire model to allow for a greater hook up ratio when casting in open water with lighter line. We recommend a medium heavy action rod with 12 - 16 lb test. Look for rock or brush near deep water and give this jig a try. Designed by FLW Tour Pro Brent Ehrler.